Study reported that those who used medical marijuana were able to take fewer opioids. A new study has investigated what patients themselves prefer when it comes to managing pain — opioids, which are widely distributed for intense pain relief, or medical marijuana. The researchers found that the patients themselves much prefer medical marijuana, and many believe it is just as effective for their pain. “This study can conclude that medical cannabis patients report successfully using cannabis along with or as a substitute for opioid-based pain medication,” the team reported in the journal Cannabis and Cannabinoid Research. The researchers, from University of California Berkeley and Kent State University emailed participants a survey asking them about their pain, and their opioid and marijuana usage. Out of the 2,810 participants who were currently using cannabis, 828 had used opioids in the last six months to manage their pain. Of that group, “97 percent of the sample ‘strongly agreed/agreed’ that they are able to decrease the amount of opioids they consume when they also use cannabis. In addition, 89 percent ‘strongly agreed/agreed’ that taking opioids produces unwanted side effects such as constipation and nausea,” the researchers wrote. 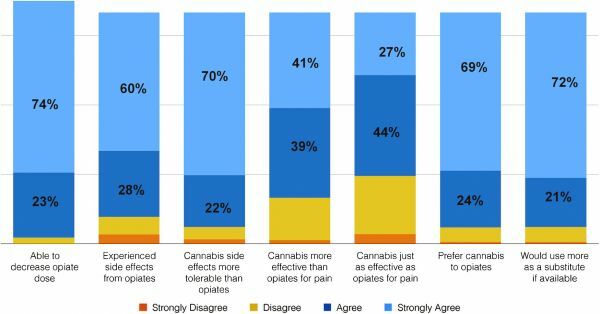 Basically — if given the choice, many of the participants would prefer to use cannabis than opioids. You can see the results from this part of the study in the graph below. Although opioids are an important part of managing pain, nearly 100 people are dying a day due to abusive opioid usage, according to the Center for Disease Control and Prevention. This is a combination of heroin, and prescription opioids such as morphine and codeine. “Prescription drug overdoses are the leading cause of accidental death in the United States. Alternatives to opioids for the treatment of pain are necessary to address this issue,” the researchers write. Although marijuana is far from a perfect solution, there has been no recorded overdoses from marijuana — and this study has shown that the patients themselves rate the drug highly for pain management. Unfortunately this study leaves some things to be desired – the reporting was all personal, which can sometimes cause biases. It also took its sample from HelloMD, an online community for medical cannabis patients, who were probably more likely to have had success with cannabis for their pain in the past. However, the study is still interesting, and shows that many people really do prefer using marijuana than opioids for pain management. Plus, it gives scientists even more of a reason to find out how marijuana affects people over longer periods, and how harm could be minimized in the future. The research has been published in Cannabis and Cannabinoid Research.